We have a large selection of blinds in varying widths, styles and materials for your home to custom fit your windows or doors perfectly. 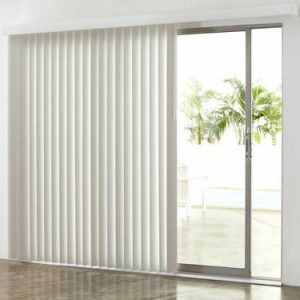 Aluminum blinds come in three different sizes. Choose from 1/2” micro, 1” mini, or 2” maxi. They are all available in a variety of colors. And — for the best value — ask to see the 1” minis that we manufacture here at Jackson’s! Same quality as the other manufacturers, just a better price. 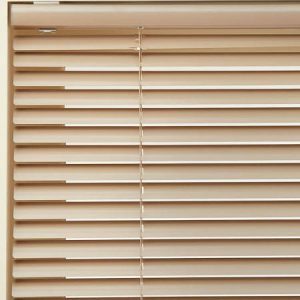 Wood blinds come in 3 different sizes: 1”, 2” or 2.5”. They are available in a wide variety of painted whites to gorgeous stains to match any decor. The 2” and 2.5” are also available as composite and faux wood if you want the look, but not the price. Add some interest by choosing from a variety of colored and printed tapes. 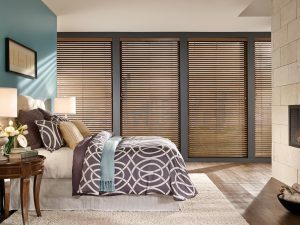 Wood blinds are also a great alternative to shutters. Same great wide-slat look at less cost. Choose from a wide variety of vinyl and fabrics to make verticals. Need more privacy than what the fabrics offer? Need to make sure white is showing to the outside? Consider inserting a fabric vertical into a vinyl groover.